How frequent? With all the genetic information around, we are often wondering how much genetic morbidity is really hidden in our genomes. Yes, everybody is a knock-out for 1-3 genes, but in most cases, these variants do not cause disease. However, what happens if you apply genomics to estimate the burden of known disease variants? 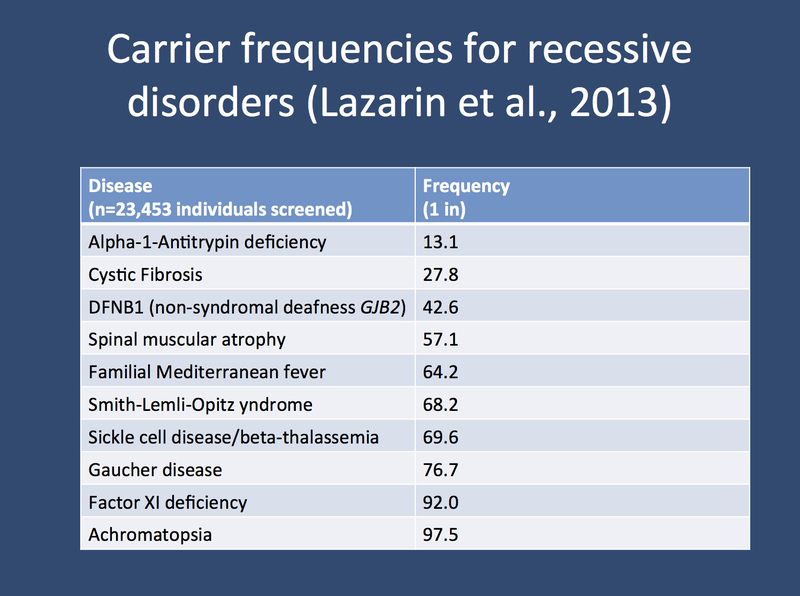 Now in a recent paper in Genetics in Medicine by Lazarin and colleagues, the carrier frequency for ~400 variants known to cause ~100 recessive disorders is investigated. 24% of all individuals are carriers for at least one recessive disorder. Carrier screening. Some recessive diseases are quite common in certain populations and for some of these disorders, the case can be made for carrier screening. In the US, in contrast to many European countries, carrier screening for Cystic Fibrosis and Spinal Muscular Atrophy (SMA) is recommended for individuals of European descent. The US-based company Counsyl offers direct-to-consumer marketing for carrier screening by looking at a panel of 417 validated variants known to cause recessive disorders. In total, 108 recessive disorders are covered with their panel. Counsyl now presents an analysis of ~23,000 individuals screened for these variants. One in four. They find that 24% of all individuals, irrespective of ethnicity, are carriers for at least one pathogenic variant involved in recessive disease. Up to 5% of patients carry two variants. The most common diseases that the individuals were carriers for included alpha-1-Antitrypsin deficiency, a condition that usually leads to progressive lung disease in adults, Cystic Fibrosis and non-syndromic deafness due to mutation in GJB2 (DFNB1). What else is out there? The publication by Lazarin and colleagues offers a good estimate on established variants involved in recessive disease. These variants are known to cause recessive disorders and genetic counseling based on these findings is straightforward at least from the genetic point of view. Given that the Counsyl array is variant-based and not gene-based, a “negative” array does not rule out disease, not even the diseases tested for. And of course the Counsyl array only investigates inherited recessive disorders, which might be less relevant for epilepsies compared to de novo mutation, dominant mutations and copy number variations. Nevertheless, in some fields, genetic carrier screening is a success story. Tay-Sachs disease, which has a particularly high carrier rate in individuals of Ashkenazi Jewish descent, is virtually extinct in this population due to carrier screening. This entry was posted in 2013, Familial epilepsies, Publications and tagged alpha-1-Antitrypsin deficiency, autosomal recessive disorders, carrier screening, Counsyl, cystic fibrosis, recessive mutations, Spinal Muscular Atrophy, Tay-Sachs disease. Bookmark the permalink.